FS: 135 shipped. Raceface Aeffect Cinch, 24mm EXI spindle, 170mm arms With 30T narrow wide Cinch chain ring, direct mount. Full disclosure, I could not get this to play nicely with my CK press fit 24 so I’m going back to Shimano xt cranks. 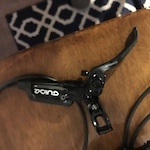 Not sure what the issue was but no reason to think it won’t jive with a RF or Shimano BB or a CK if your more mechanically inclined than I am. Just didn’t want to spin freely in my BB. 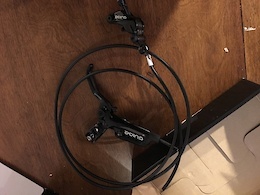 Never ridden, but a couple attempted installs, so product has some lubrication on it, but other than that no wear whatsoever. Has all original parts, preload nut, pedal washers, black/red washer. original box for cranks, but not for the ring itself. Cheapest I found online was 152.00 for ring and arms shipped Motivated to move it quick: 135 shipped to lower 48. Can ship tomorrow or Saturday as needed. Posted in "Post your Stanton Bikes"
2016 New Never Ridden, SRAM Guide R Front AND Rear Brakeset. Includes Cables, 140 without Rotos, 190 with rotors. Rotos are 180mm f/r 6 bolt design. Add 15 for shipping. Or best offer, reasonable offers only. 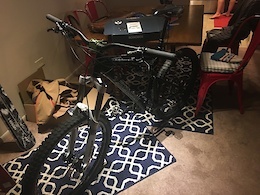 2016 New-Takeoff from Yeti SB 5.5 SRAM 1X11 GX Drivetrain Rear Deraileur 1x11 Crankset Rear Shifter Bottom Bracket 350 w/o Casette 400 w Casette Casette: 11x42 SRAM 11 speed +15 for shipping OR BEST OFFER, Reasonable offers only, serious inquiries. New Takeoff DT Swiss E1900 Spline 29"